Also known as The Oaks Stakes, or Investec Oaks, the Epsom Oaks is a group one flat race that is held in very high regard in the racing world. 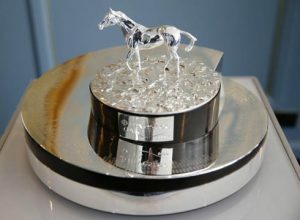 The race is for three year old fillies and takes place at Epsom Downs racecourse in early June of each year over the distance of 1m 4 furlongs 6 yards. It’s inaugural run was held way back in 1779 which makes it one of the oldest horse races in the World. For perspective the Grand National was first held in 1839. The Oaks is one of the five British Classics (1,000 Guineas, 2,000 Guineas, The Oaks, The Derby and the St. Leger), all events founded around the same period of time and that came to represent the best of flat racing. The Oaks is the second oldest of the classics after the St Leger, which was founded the year previous. The Oaks also forms part of the Fillies Triple Crown which consist of 1,000 Guineas Stakes, Epsom Oaks and St. Leger Stake . The last winner if the Triple Crown was Oh So Sharp in 1985, and prior to that Meld 30 years previous. With such tradition embedded into the Epsom Oaks, it’s no wonder that there’s a healthy prize pot to accompany it. The purse for the race is £500,000, with over half of that going to the winner of the race. Such is the influence of the Oaks that there are regional variations all over Europe. With such an illustrious history going back literally hundreds of years, it’s hard to highlight moments or achievements that stand out. An early high achiever in the race was jockey Frank Buckle, who won on Nike in 1797 and went on to win a further 8 times, makes him the leading jockey to this day. For more recent records we look to owner Susan Magnier , who is joint leading owner (alongside the 4th Duke of Grafton!) with six wins including wins as recent as Minding in 2016 and in 2018 7-1 winner Forever Together – who beat 5/2 favourite Wild Illusion. Sandwiched between those races we see the fastest ever Oaks time of 2m 34. 13s by Enable ridden by none other than Frankie Dettori and trained by John Gosden.